When Markus spied the elderly woman struggling to pull a chair from the trunk of her car he didn’t hesitate. The fourteen-year-old pulled his bike off the road and gently asked if he could help. Once the chair was in the house there were a few words of conversation before the bronze-skinned boy jumped on his bike and headed to the convenience store where his mom worked. As he helped to stock the shelves, Markus told his mother about his new job. Muriel had to beg her son to slow down so she could understand what he was saying. Come to find out the elderly woman was in desperate need of someone to maintain her lawn and gave Markus the job. After helping his mom, the teen headed home where his best friend, John, was waiting. Soon their friend Chris called asking if they wanted to go to the park … said his dad would take them. Heck yeah, they were ready to get out of the house. Markus called his mom to make sure it was okay. The boys hung out till it was dark and time leave. Chris and John each called their dad looking for a way home. “What do you mean he wouldn’t give you a ride?” Muriel raged. “I’m not giving him a ride, that’s what he said,” Markus repeated. The young boy sat alone in the park until his mother finished work. You see, Markus is black and Muriel is white. Muriel has grown children and wasn’t looking to raise another, taking Markus came about through a personal situation. She took him home at birth; it was love at first sight. There were fearful times when Muriel thought she would lose her son. Only she was not about to give up the child that she loved so deeply. It was a long, grueling struggle before she was finally able to adopt Markus. 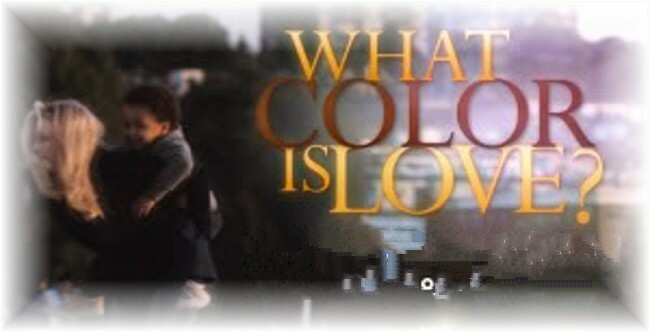 Ever since I was a young girl I have asked: What color is love? This entry was posted in About Us and tagged adopt, black, color, love, white. Bookmark the permalink.